"Kelly Rimmer has outdone herself. I thought that Before I Let You Go was one of the best novels I had ever read...If you only have time to read one book this year The Things We Cannot Say should be that book. Keep tissues handy." --Fresh Fiction"Fans of The Nightingale and Lilac Girls will adore The Things We Cannot Say." --Pam Jenoff, New York Times bestselling authorIn 1942, Europe remains in the relentless grip of war. Just beyond the tents of the Russian refugee camp she calls home, a young woman speaks her wedding vows. It's a decision that will alter her destiny...and it's a lie that will remain buried until the next century.Since she was nine years old, Alina Dziak knew she would marry her best friend, Tomasz. Now fifteen and engaged, Alina is unconcerned by reports of Nazi soldiers at the Polish border, believing her neighbors that they pose no real threat, and dreams instead of the day Tomasz returns from college in Warsaw so they can be married. But little by little, injustice by brutal injustice, the Nazi occupation takes hold, and Alina's tiny rural village, its families, are divided by fear and hate.Then, as the fabric of their lives is slowly picked apart, Tomasz disappears. Where Alina used to measure time between visits from her beloved, now she measures the spaces between hope and despair, waiting for word from Tomasz and avoiding the attentions of the soldiers who patrol her parents' farm. 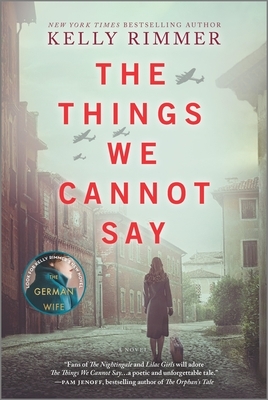 But for now, even deafening silence is preferable to grief.Slipping between Nazi-occupied Poland and the frenetic pace of modern life, Kelly Rimmer creates an emotional and finely wrought narrative. The Things We Cannot Say is an unshakable reminder of the devastation when truth is silenced...and how it can take a lifetime to find our voice before we learn to trust it.